Oysters aren’t the most exciting kind of seafood around. They don’t spend their days sweeping majestically through icy Northern waters, or display their athleticism by leaping up waterfalls in search of breeding grounds. Instead, they cluster together in shallow water, where they feed on all the gunk nobody else wants – plankton, bacteria, dissolved organic material, and anything else that happens their way. In a glamor contest, they’d lose. But in a nutrition competition, they’d put in an impressive showing. And they’re one of the easiest and most ethical kinds of seafood to farm, so they don’t raise all the sustainability concerns of eating tuna or salmon. A flavor that goes well with both butter and bacon just clinches the deal: oysters definitely deserve a more prominent spot in the Paleo pantry. Zinc: 16.6mg, or 111% of the RDA. 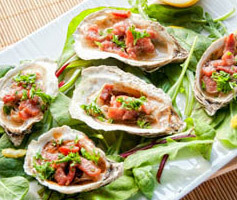 Oysters are our best-known food source of zinc, an essential mineral for mental health, immune function, and fertility. Their impressive zinc content is the reason for oysters’ reputation as an aphrodisiac (which, unfortunately, is probably a myth, but it can’t hurt to try!). Iron: 5.1mg, or 28% of the RDA. Iron is especially important for pregnant women, but iron supplements can be quite hard on your stomach, so iron-containing foods are valuable. Selenium: 77mcg, or 110% of the RDA. Selenium is the reason you don’t have to worry about mercury poisoning from fish. It binds to the mercury and makes it harmless to your body (like a useful version of phytic acid). It’s also important for thyroid health, and modern soils are very deficient in selenium, so most of us don’t get enough. Vitamin B12: 16mcg, or 267% of the RDA. B12 is an essential nutrient only found in animal products. It’s crucial for neurological health, energy, and mood. Vitamin A: oysters are rich in preformed Vitamin A, the kind you can only get from animal foods. Sweet potatoes and other orange plant foods contain beta-carotene, which your body has to convert to Vitamin A before using it; this isn’t nearly as efficient as getting it directly. If you aren’t eating liver regularly, oysters are a smart choice. Copper: 1.6mg, or 79% of the RDA. Copper deficiency is one potential cause of high LDL cholesterol on Paleo. Some people worry about copper toxicity (eating too much copper relative to zinc), but this isn’t a problem with oysters since they have about 10 times as much zinc as copper. Vitamin C: 8mg, or 13% of the RDA. Vitamin C is a pre-antioxidant and a boon to your immune system. The Vitamin C in oysters is especially valuable if you’re avoiding fruit. 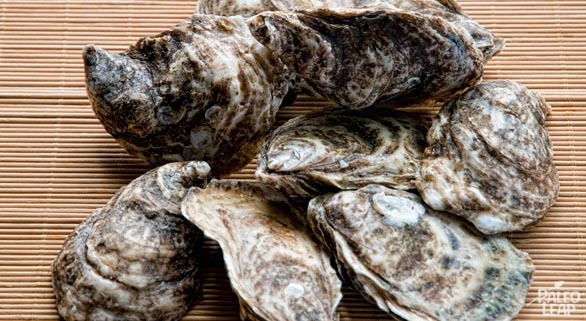 As well as an impressive list of micronutrients, oysters also provide plenty of protein. They don’t deliver as much in the fat department, but like most other seafood, they do have an excellent ratio of Omega-3 to Omega-6 PUFA. Oysters can be eaten either raw or cooked – some gourmets refuse to eat them cooked at all, but others won’t touch a raw oyster for fear of contamination. The real concern here is bacterial infection: even when they’re raised in clean, natural environments, oysters often contain a species of bacteria called Vibrio vulnificus, which is more dangerous than salmonella (the mortality rate is around 40%). The good news is that overall healthy people don’t have a lot to fear: the danger of V. vulnificus is primarily a concern to people who already have weakened immune systems. Healthy oyster fans don’t have as much to worry about, since they can usually shake off the infection within a couple days. As an alternative to the risk of raw seafood, the shellfish industry is working on various methods of eliminating these bacteria without cooking the oysters (for example, by freezing them in special ways). Oysters that have been treated like this are called Post-Harvest Processed (PHP) oysters. 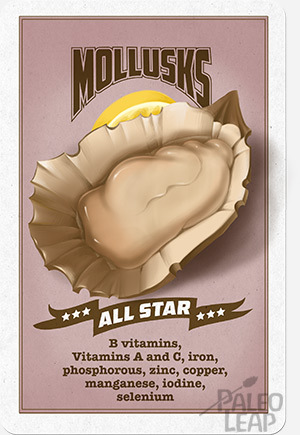 They have much lower levels of V. vulnificus, and they’re generally safer to eat. On the other hand, some oyster aficionados find that the sensory experience of eating PHP oysters just isn’t the same. The fresh vs. PHP oyster decision is a judgment call that everyone has to make individually (although if you’re going to eat raw oysters, it’s worth at least trying the PHP kind). And obviously, it’s a bad idea to get oysters from a source you don’t trust. But for most people, it’s really a matter of personal preference whether you like them raw or cooked – the nutritional value isn’t seriously affected either way, and raw oysters aren’t terribly dangerous for healthy adults. Most seafood raises huge concerns about sustainability and overfishing. Harvesting methods used on wild-caught fish are incredibly destructive, but farmed fish aren’t much better, since they just shift the damage down the food chain to the smaller “prey fish” that have to be caught to feed them. Fish farms also release very concentrated doses of pollution into the ocean, and the fish raised in them aren’t nearly as nutritious because they aren’t fed their natural diet. This picture of undersea ethics is pretty dim. But farmed oysters don’t actually raise any of these concerns, so they’re ideal for concerned carnivores who want the benefits of seafood without the environmental consequences. Oysters are perfectly happy to set up shop in oyster farms without any of the environmental concerns that apply to more mobile species like salmon or tuna. They’ll attach to man-made frames just as readily as anything else, and they get all the food they need from the water around them. Unlike fish farms, which release huge amounts of waste and chemicals back out into the oceans, oyster farms are actually good for the ocean – the oysters help remove bacteria and sediments from the water, making the environment safer for other species. Oysters are also free from the environmental toxins that sometimes lurk in larger fish. The best-known is mercury, although mercury isn’t actually dangerous in most fish because the selenium naturally found in the fish binds to the mercury, protecting you from harm. But there are several other toxins that can seep into the water from different kinds of pollution and runoff. These toxins tend to concentrate up the food chain, so they’re highest in the big predator species. Oysters, being so low on the food chain, have very low concentrations. Especially if you plan on eating them raw, it’s important to get the freshest highest-quality oysters you can find. When you buy your oysters, make sure that their shells are still shut tight, or that they snap shut when you tap them. This shows that the oysters are still alive. If you like them cooked, the shells should open up during the cooking process; throw away any that stay closed. If you don’t have a local fish market, you can probably also find frozen or canned oysters at the grocery store. As well as being more convenient (because you can store them for longer), they’re usually cheaper, although some raw fans claim the texture isn’t quite the same. For cooking and serving oysters, make sure to use plenty of fat, since the oysters themselves are very low in fat. For a very simple preparation, they’re delicious steamed with some butter and herbs, or bacon fat for extra flavor. Some people also prefer fatty or creamy sauces with white wine, garlic, or onions. You can also bake them, fry them, or use them as part of a stew or soup (maybe with some potatoes for a hearty winter lunch). Raw oyster recipes might sound like an oxymoron, but even raw oysters are often dressed up with sauce or garnishes. Purists eat them with just a sprinkle of lemon juice, or a dash of hot sauce, but you can get as fancy with the condiments as you like. Oysters Rockefeller are enjoyed cold, garnished with onions and herbs. Oysters Casino (served warm with bacon, butter, and spices) are also popular. There are really as many recipes for oysters as there are chefs who love them – whatever your favorite ingredient is, chances are good that someone has figured out how to make it work. Oysters aren’t a food that most of us eat very often, but maybe that should change. They’re easy on the planet; unlike seeking out grass-fed beef or pasture-raised chicken, you don’t have to go to any extra effort to find sustainable, ethically raised oysters. As the Paleo movement keeps expanding, we’re going to have to increase our pipeline of sustainably sourced animal products, and oysters are a great place to start because we already have a good system in place that can easily be increased. Oysters are also full of health benefits, especially for newly-converted vegans (who are likely to be deficient in iron and Vitamin B12). They’re easy to prepare and delicious with almost any kind of fat, a perfect ingredient in all kinds of Paleo recipes. Even if you remember hating them from years ago, try a taste after going Paleo for a few months – your taste buds can change dramatically when you cut out processed foods from your diet, and you might be pleasantly surprised!